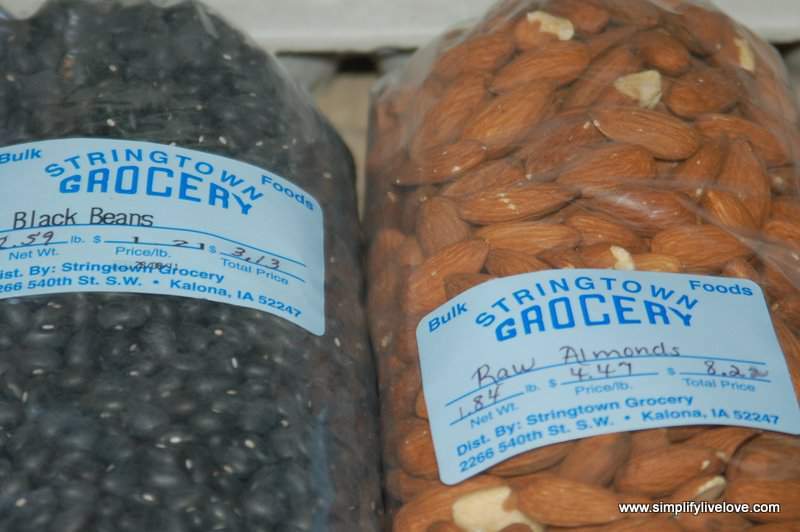 Kalona Iowa has lots of fun Amish stores including Stringtown Grocery – one of my favorite bulk food stores around. 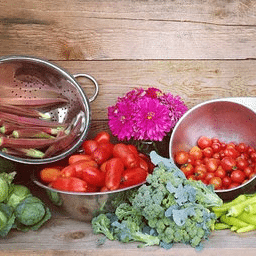 Some of my favorite things to buy at Stringtown change depending on the seasons, but some are always the same. Wondering about Stringtown? Here’s what to know! Stringtown in Kalona is not your typical grocery store. If you’ve never been to an Amish store before, you might not know what to expect. 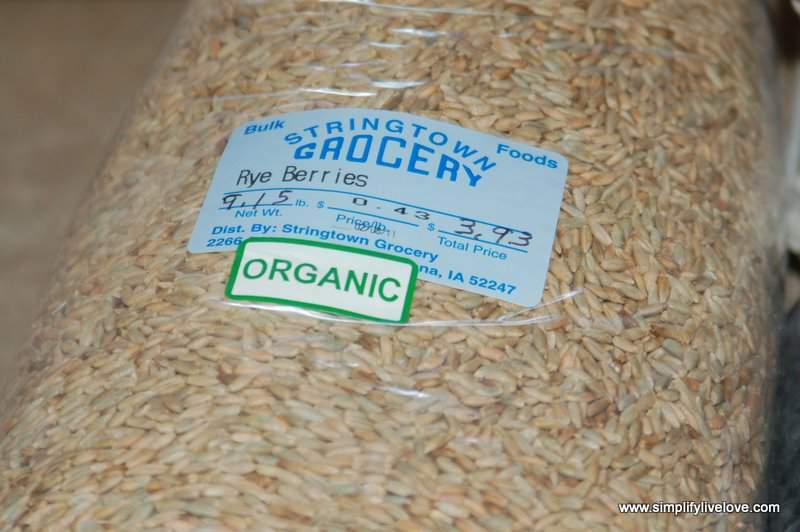 But if you have been to an Amish bulk food store, you probably have a pretty good idea of the type of food you can find at Stringtown. I love shopping at Stringtown for certain items, but tend to be more careful about other things. 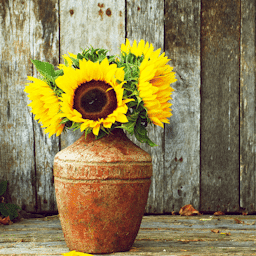 Here’s what you need to know about Stringtown and the stuff you’ll find there! 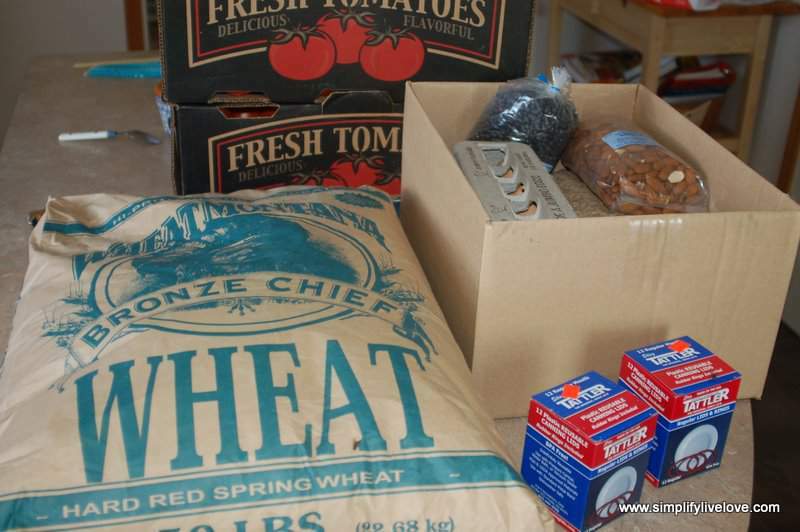 I was most excited to find 50 lb of Hard Red Wheat Montana for $23. I stocked up on hard white wheat for a little less in Missouri, but I’ve really been wanting some hard red wheat. I like the hard white wheat for artisan bread, waffles, cakes, and pancakes, because it is more similar to unbleached flour, but I love the red wheat for my 100% Whole Wheat Bread. I also found BPA-free canning lids! 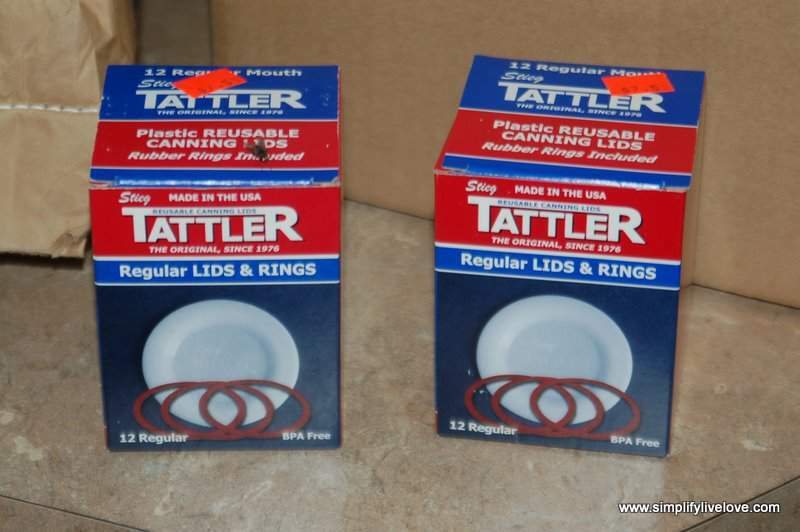 Amazon.com sells them, too, but Tattler Reusable Regular Canning Lids & Rubber Rings – 12/pkg were quite a bit cheaper at Stringtown. I was so excited to find rye berries for super cheap – .43 / lb!!! And finally, I got some more black beans and some RAW almonds. Did you know that nuts are pasteurized unless they specifically say raw? Yup. I just found this out recently. The “raw” nuts I’ve been buying from Sam’s Club are not raw at all. So I added a bag of raw almonds to my purchase. A couple dozen farm fresh eggs rounded out the purchase. I spent just over $60. Of course, I cross-referenced their prices with prices on my Grocery Price-Point List. Most of them are still good! 🙂 Do you shop at Amish bulk food stores? I highly recommend them. 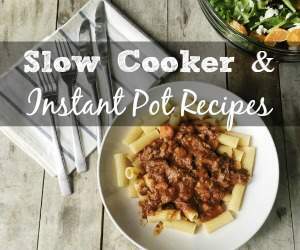 They have great products and super prices. 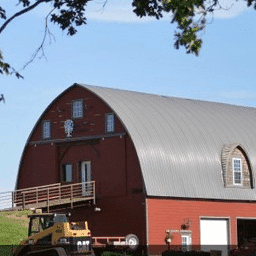 What’s your favorite store in Kalona Iowa? I’d love to hear! Another one of my favorite Amish stores in Kalona Iowa is Central Discount Grocery. Check out all they have to offer here! What a great post! We've been wanting to do this, too, for a long time....how do you find markets like this? Word of mouth, mostly. Amish markets don't really advertise. Lots of people told me about this place before but I never knew where it was until today. We lucked out and found it! We stopped at a store and asked where this particular one was located. Sometimes, towns have brochures with places of interest noted, if you have any Amish/Mennonite areas in your locale. You can also try google, but I've had less success with that. Good luck! Fun fact: A lot of Philly and Pennsylvania in general is tax free 'cause of the Amish and stuff. In my area (Northwestern PA), we have some Amish communities and there are several discount grocery stores/bent-n-dent stores run by them. I buy tons of stuff there and often find organic pantry items for WAY cheap.....Newman's Own, Cascadian Farms, Muir Glen, Simply Organic. Some items are past the sell by date but many have 2 years to go still. I buy all my hubby's coffee there. He'll only drink Starbucks and I often find whole bean bags for $3.00 or less, so I stock up. I figure I save between 50-75% on everything I buy. 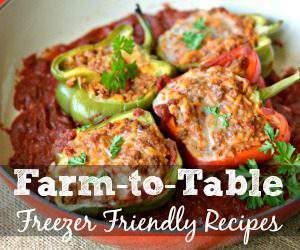 It's my favorite way of saving money on food! I found a store like that not too far from where my parents live in Missouri. I love going there and stocking up on fun food items. Looks great. Didn't know that about the almonds. Interesting little tip. Was the flour the berries or already milled? That is a good price. Never visited an Amish store but would love to go to this one. Maybe another road trip in my future! I bought berries. They had 50 lb bags of flour too, but I didn't pay attention to the prices. How big was Stringtown? I've visited at no frills bulk store in a small town with my SIL, but I'm wondering if I could find some place with more selection. Michelle, can you give me directions to Stringtown in Kalona, IA? Thank you! Barb, if you're in Kalona, head north on Hwy 1 (towards IA City). Look for the Cheese Factory. It will be on your right. Take a right to get to the grocery store. It's just a block or so on down so it's pretty close. When we were there, they were doing road construction though, and we had to detour through country roads. If they're still doing road construction instead of taking the right at the Cheese Factory, you'll take the right just BEFORE the string factory and you'll basically be going around the mile square and looping back at it. There are detour signs to direct you. It's not too hard. The Cheese Factory people can help you too, if you miss the signs. :-) Good luck! So, if they're still doing the construction, if you're headed north on Hwy 1 from Kalona and you get to the Cheese Factory, you've gone too far. Make sense? I also like the community country store located a mile or two down the road and then about 1.5 miles to the right, and the central discount store located further down the road from stringtown check it out. They also have a small store that sells farm supply and boots check at the cheese factory for maps. Another great place is the kalona bakery in town where they make the noodles, they also have a sandwich shop. The antique stores are great in the town of kalona as well as the hardware store.